UNIONPORT -- There are so many abandoned dogs looking for new homes, and one dog in the Bronx had to wait longer than most. Tank spent years in a no-kill shelter watching younger, smaller dogs find homes one after another. A once unadoptable dog not only eventually found an owner; he also made volunteers out of an entire family. At 110 pounds, with a head bigger than some humans, Tank, an American bulldog, can be a little intimidating. 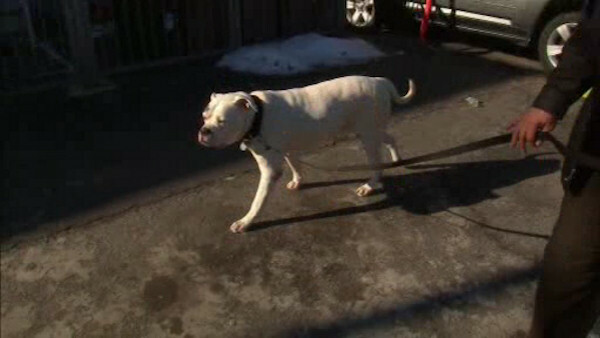 "He's a big dog, yes," said Gabriel Maldonado, Tank's owner. Maybe that was the reason Tank sat at NYC's Top Dog No-kill Shelter for three years without being adopted. "People would just pass him over because, ugh no, he's too big," said Pedro Rosario, NYC's Top Dog Shelter. He was the facilities longest resident until Gabriel Maldonado saw him at an adoption event. "I was walking down the block and I saw Tank standing there with his big orange adopt me vest on. He looked at me, I looked at him, we kind of got a little closer," Maldonado said. The bond Maldonado immediately shared with Tank left him wanting to know more about the shelter and eventually he became a volunteer. "Going a couple days a week, six, seven times a week walking Tank. I'd take him out by himself, I'd take him out last so I could spend time with him," Maldonado said. Maldonado's visits with Tank became longer, and the man who never owned a dog before decided Tank's big day had finally arrived. "I was missing him, I was thinking about him. I have three boys, I could have a fourth boy," Maldonado said. "When the kids go to college, it's like 'Oh no, don't go,' but we happy," Rosario said. Tank has become a part of Maldonado's family, their first dog ever. Although his sheer size may have frightened people off before, it's what makes him so lovable to the Maldonado family. "I think he knows that we love him and he wants to love us right back. I think he was tired of being in his two by four and now he has a whole house that is his," Maldonado said. The Maldonado family says the big take away here is that older, large dogs really do make great companions. This Saturday NYC's Top Dog shelter will be having an open house if you want to find a furry friend just like Tank.